Samantha Okazaki and Sarah Gormley ham it up on the other end of the camera. 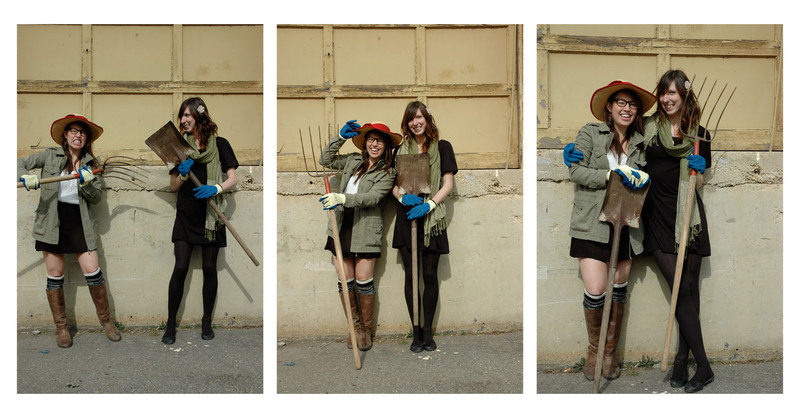 The two will be setting up a garden-themed photo booth on Saturday, March 23 as part of the Community Forklift’s Spring Soiree. Picture this. Professional photographer Sarah Gormley was in a pickle. She’d been on a particularly difficult shoot for a corporate client involving a photo booth and was having a devil of a time shaping the assignment into the visual feast she’d envisioned. Frustrated, she called her new best friend Samantha Okazaki. The two young District of Columbia photographers pulled an all-nighter to meet Gormley’s deadline. Not only was the final product well received, but the bond between the two women also had deepened. During that frenetic, sleepless scramble last October, the duo also clicked on a joint business plan. That aha moment emerged in January as the eponymous Sarah and Samantha Photobooths and Event Photography. It gives both of them a chance to highlight their strengths and indulge their inner whimsy. That fancifulness will be in its full glory on Saturday, March 23 at the Community Forklift’s Spring Soiree. Gormley and Okazaki are in the midst of customizing one of their painstakingly constructed 8-foot by 8-foot by 10-foot photo booths with a green-thumb theme to tie into the Forklift’s fourth annual Garden Party and Spring Sale. No doubt their ingenious backdrop, banners and props will incorporate surplus and salvaged baubles from the Forklift’s shelves. 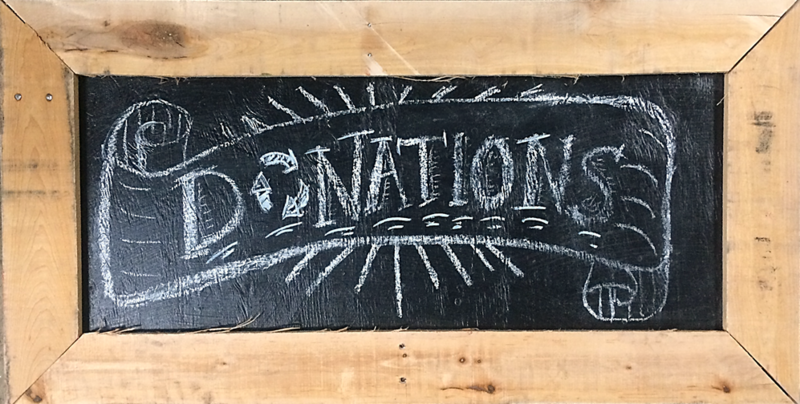 In the spirit of cooperating with a nonprofit they view as a role model, the two are donating their time and photographic talent to the Forklift’s fundraiser that day. Their hope is that soiree attendees who enter their one-of-a-kind booth as strangers will exit as friends. 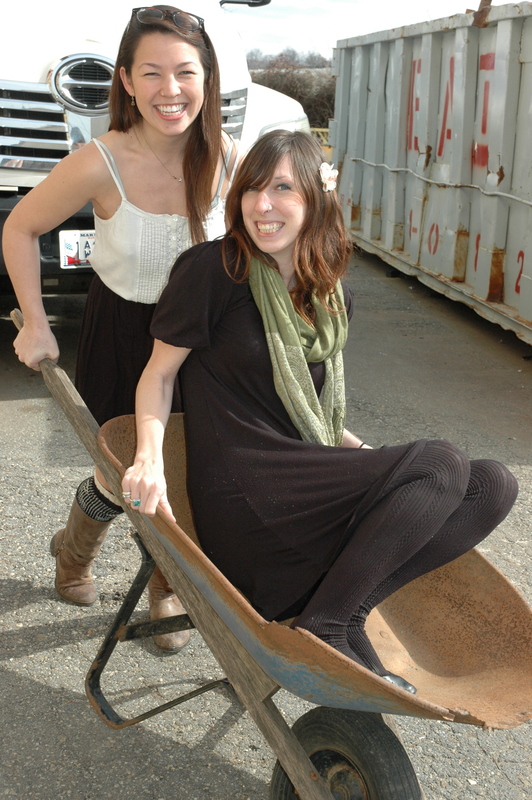 Clearly, March 23 won’t be the first visit to Edmonston for these two Community Forklift groupies. Gormley launched a dual photography career after earning an English degree, with a specialization in government, justice and peace studies, from Georgetown University. In addition to her day job as a corporate photographer, the Columbia, Md., native specializes in unconventional wedding portraits. That latter pursuit is what first drew her to the Forklift. For instance, she incorporated some bargain doors and vinyl albums as props for portraying how to execute a “Vintage Vinyl Wedding” theme. Okazaki’s initial Forklift encounter came last year at the H Street Festival in Northeast Washington, D.C. She had recently moved to the city for a job as a videographer and photographer at a nonprofit business. As a newcomer, the Californian, raised in the San Francisco region, was seeking “cool furnishings” for her apartment. Samantha Okazaki and Sarah Gormley turned to the Community Forklift for inspiration in co-founding Sarah and Samantha Photobooths and Event Photography. 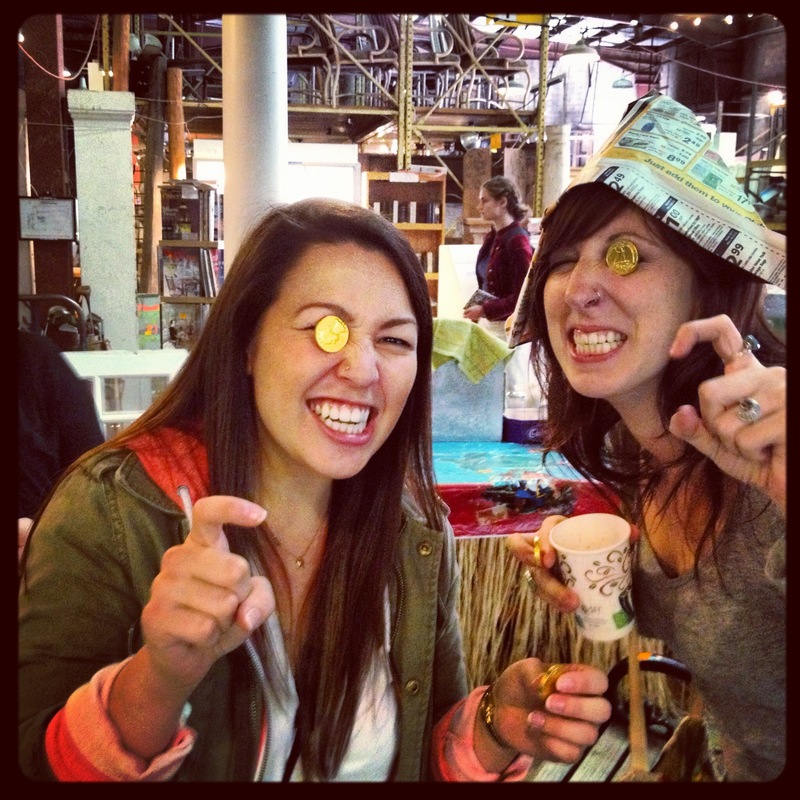 Here, they mug at the Forklift’s Pirate Party in October 2012. They first visited the Community Forklift together during the late October Pirate Party—as Gormley explained, “Dogs are allowed, we got to dress up, what other motivation did we need?”—just after they had brainstormed their photo booth venture. They finish each other’s sentences just as they complement one another’s skill set. Gormley, mostly self-taught on the photography front, has accumulated a lengthy list of potential business clients. Okazaki gained expertise in magazine-quality lighting while earning a photojournalism degree from Syracuse University. She also has a knack for designing the team’s trademark backdrops. Not surprisingly, they met as college students studying light and images in the autumn of 2011. They both participated in a Syracuse program that exposed them to photojournalism in Europe. 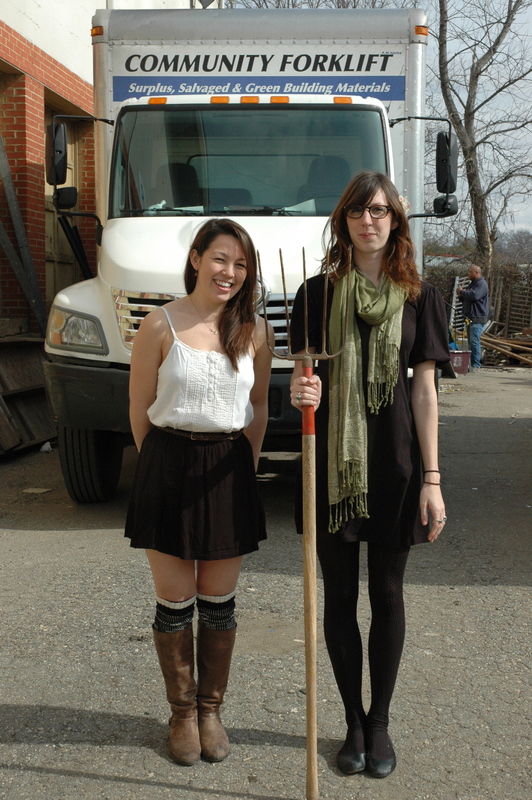 With apologies to Grant Wood, Samantha Okazaki and Sarah Gormley strike an American Gothic pose during a visit to the Community Forklift. Although they joke about photo booth start-ups now being as ubiquitous as specialty cupcake bakeries, the two entrepreneurs yearn to offer their customers something less fleeting than a dessert that lasts for just a few blissful bites. “Our name itself reflects what we are trying to be,” Okazaki said. That, the two women agreed, is a business like the Forklift with a comfortable, homegrown feel that focuses on nurturing connections. Both Gormley and Okazaki admitted to rarely—if ever—leaving 4671 Tanglewood Drive empty-handed.